In his first public appearance since being apprehended in a bloodied boat in a Boston suburb on April 19, Dzhokhar Tsarnaev pleaded not guilty to 30 counts related to April's Boston Marathon attack, including the use of a weapon of mass destruction to kill. 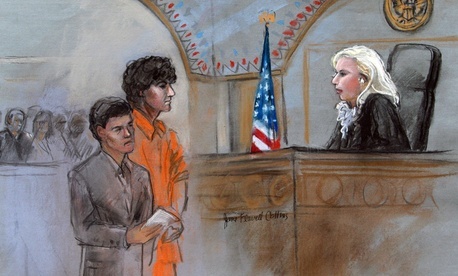 Tsarnaev, who reportedly confessed his responsibility in a note found in the boat, yawned and slumped in the courtroom as he repeatedly answered "not guilty" in a Russian accent and blew a kiss to a woman in the courtroom. The "not guilty" plea, as odd as it may sound, is not unusual in high-profile crimes where the suspects seem to have been caught red-handed. In January 2011, the suspect in the Tucson, Ariz., attack on then-Rep. Gabrielle Giffords that killed six people pleaded not guilty to three charges of attempted murder. The 23-year-old suspect laterpleaded guilty to 19 counts of murder and attempted murder. Earlier this year, the suspect in the shootings at an Aurora, Colo., movie theater in July 2012 pleaded not guilty to 160 counts of murder and attempted murder by reason of insanity. He is now undergoing examination by the Colorado Mental Health Institute, which will tentatively be completed in August. Just this month, the suspect in the Fort Hood, Texas, shootings pleaded not guilty to 13 counts of premeditated murder and 32 counts of attempted premeditated murder. Jury selection in the case began Tuesday.